Alex lives in Bradwell Village with his wife Lynne. He was in sales for 7 years during which time he became a Christian and was ordained in 1975. He subsequently served as a vicar in Basingstoke, Brighton and London - something he describes as the best job in the world: being paid to talk about Jesus Christ. Alex has retired from full time work but is still involved in the life and ministry of the church. He has played sport all his life, although golf has now replaced rugby and he is a regular at Burford Golf Club. Alex and Lynne have 3 children and 5 grandchildren. 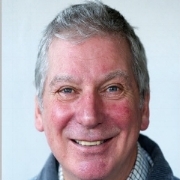 Rev Canon Andrew Wingfield Digby who is the associate minister at Swinbrook@11 has recently retired from being Vicar of St Andrews in North Oxford - a thriving evangelical church in the University city. Previously he received some notoriety as the founding Director of Christians in Sport for whom he worked from 1980 to 2002. Andrew and his wife Sue live in Asthall Leigh with their eldest grandson Josh (18). They have three children and currently 8 grandchildren with room for growth!